Buy What Can You Stack on the Back of a Yak? A hilarious new story with fabulous pictures by one of the world’s most talented illustrators, twice longlisted for the Kate Greenaway Medal. Brought to life by Adam Stower’s glorious artwork, this fantastic new picture book is told in rhythmic rhymes by Alison Green, shortlisted for the BookTrust Early Years Award for The Fox in the Dark. Captain Quack and his loveable yak deliver the post to the mountains and back. At least, that’s the idea. But Yak loses all the post, and keeps picking up friends instead. Stranded baa-lambs; lost chickens; even some hitch-hiking rabbits – Yak stacks them all up on his back, till he surely can’t carry any more. Or can he? 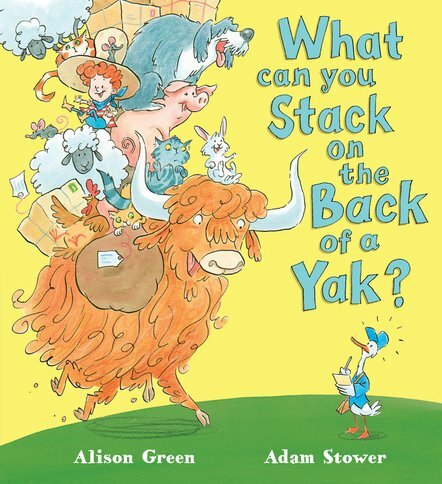 Join Quack and Yak on their brilliantly bonkers journey, and find out just how much you can stack on the back of a yak!